The gymnastics medals at the Rio Olympics are all spoken for. The last event final was yesterday, but athletes took to the floor for the gala today, in which Olympic gymnasts strip, dance, and generally do cool gymnastics moves for the crowd to laugh at. The best one was this human jumprope. 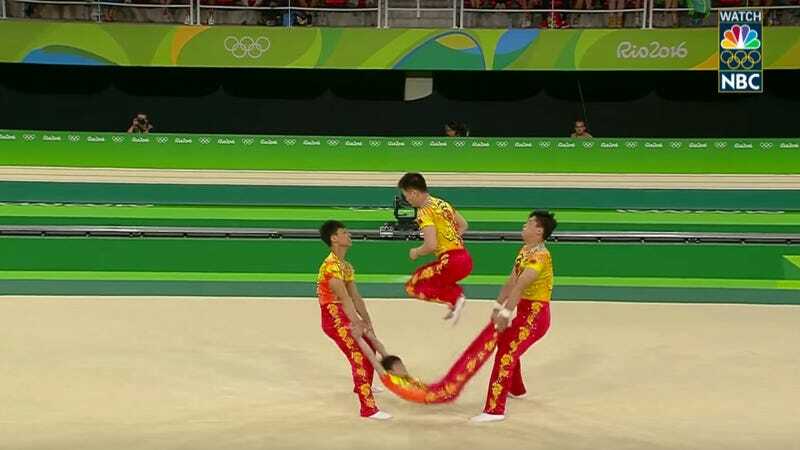 I’m noticing that none of the gymnastics teams did that in the real Olympics, which seems like a missed opportunity, if you ask me. Is Steeplechase Dangerous? Ask This Dude&apos;s Face.